Either way, eating is not something I usually spend too much time thinking about each day. When I get hungry, I sit down and eat. I know that food is usually accessible when I need it. Now, I am sure you have heard of those people who “forget to eat” during the day because they are busy, or just not foodies like myself. I admit, that I never forget to eat and if I don’t get food in my belly at the appropriate time, I become cranky, unfocused and for the most part generally unproductive. I might begin to feel light-headed, aggravated and weak. The loud noises emerging from my stomach serve as a constant reminder that I need to feed my cranky tummy! There have been a few times in my life that I can recall feeling ravenously hungry, without a sure sign that there would be food in my near future. This was a very scary and unnerving feeling. In January, I returned from living in Los Angeles. While in LA, I became very close with a homeless woman in my neighborhood. I saw her almost daily and we spent hours of our time together chatting about life. I learned so much about what it means to be homeless, but mostly about the daily struggle of getting a meal. I learned that it takes more time than I could have ever imagined to plan a way to eat and find resources for food. Money, weather and location all play a role in this battle. 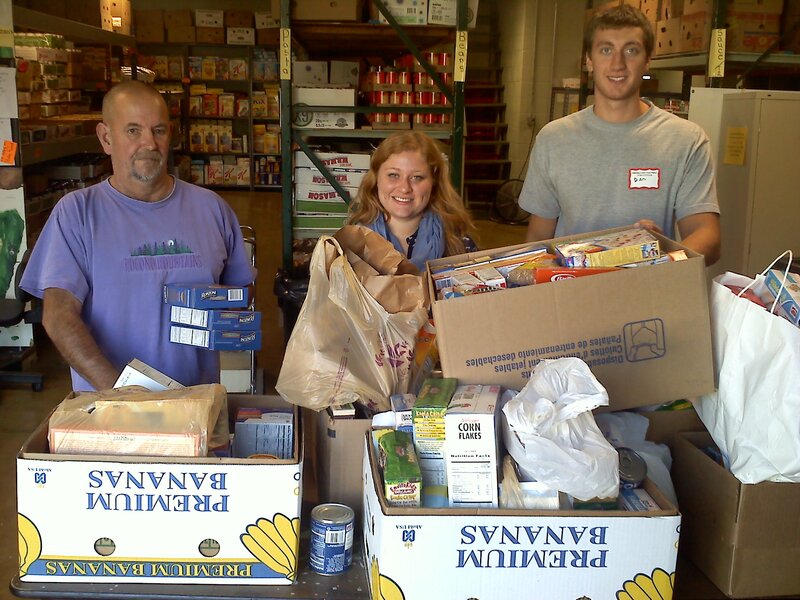 A few weeks ago, several AmeriCorps members took the initiative to start a food drive here at CHC. All of the food collected went to the Amazing Grace Food Pantry here in Middletown, CT. I am proud to announce that as a result of collecting food from CHC staff and AmeriCorps members, we were able to donate over 375 lbs of food to Amazing Grace! Let this serve as a reminder that food is fantastic. It is precious and we must not take it for granted. Remember that there is always a food pantry that would be happy to accept a donation from you at any time of the year. Food equals freedom…the freedom to feel, fend, and focus! Thanks again to all of you who made contributions to this food drive! !